The notice addressed how the registrars were failing to implement the changes to the Elections Code, known as AB-195, that had become effective on January 1, 2018. The Notice was titled "School Measures for June 2018 Primary / Election Code Requirements and Proposition 39 Qualifications." It was sent within the 10-day public examination period of the Proposition 39 ballot measures that were placed on the ballot by 40 different districts. It covered several areas where the election officials were not following the law. In every case where the law wasn't being followed, the elections officials were, figuratively, putting their thumb on the scales of justice (due process) to favor the government agency (the school or college district) over the people (you and I). Because the material changes to Elections Code Section 13119 were new, most of the notice addressed those changes. Of the 25 registrars who were served notice, only a handful responded in writing. Not a single one, however, complied with the new requirements set out in Section 13119. (a) The ballots used when voting upon a measure proposed by a local governing body or submitted to the voters as an initiative or referendum measure pursuant to Division 9 (commencing with Section 9000), including a measure authorizing the issuance of bonds or the incurrence of debt, shall have printed on them the words "Shall the measure (stating the nature thereof) be adopted?" Opposite the statement of the measure to be voted on, and to its right, the words "Yes" and "No" shall be printed on separate lines, with voting squares. If a voter stamps a cross (+) in the voting square after the printed word "Yes," his or her vote shall be counted in favor of the adoption of the measure. If he or she stamps a cross (+) in the voting square after the printed word "No," his or her vote shall be counted against its adoption. (b) If the proposed measure imposes a tax or raises the rate of a tax, the ballot shall include in the statement of the measure to be voted on the amount of money to be raised annually and the rate and duration of the tax to be levied. (c) The statement of the measure shall be a true and impartial synopsis of the purpose of the proposed measure, and shall be in language that is neither argumentative nor likely to create prejudice for or against the measure. Material changes (areas of non-conformity) highlighted. These are the registrars that were put on notice. Section 13119 is part of Chapter 2 of Division 13 of the Elections Code. Beginning at Section 18000, the Elections Code proscribes a bunch of crimes related to the Elections Code. Section 18401 is of particular interest. 18401. 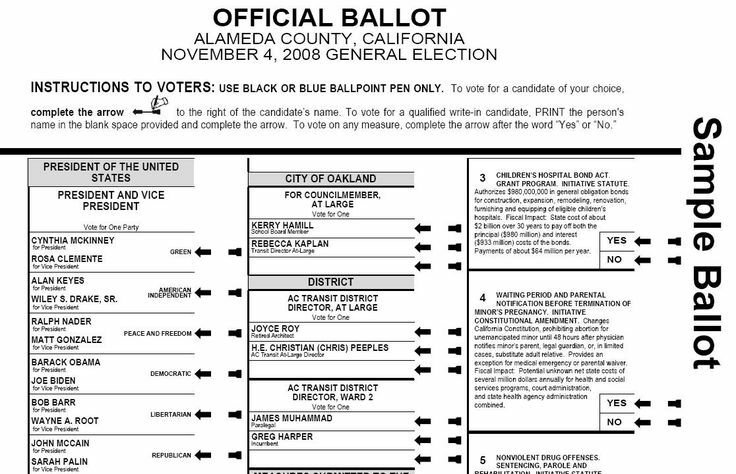 Every person who prints any ballot not in conformity with Chapter 2 (commencing with Section 13100) of Division 13, or who circulates or gives to another any ballot, knowing at the time that the ballot does not conform to Chapter 2 (commencing with Section 13100) of Division 13, is guilty of a misdemeanor. Every elected county registrar (18 are appointed) is up for election in June. Some might even have to go to a run-off election in November. If you know a candidate who is running against your county registrar, then have the candidate call me to learn how to most effectively use this in their campaign. The shoe is going to drop again not only on the 25 counties who will receive a second notice shortly, but also on the remaining 33 counties. Do you think they'll follow the law this time around? The next step is to file criminal complaints against the registrar and John Does (those we don't know) with each district attorney's office in each of the 25 counties where the registrar violated the law. What About Cities and Other Special Districts? Will they have a tax measure on the November ballot? Then Elections Code 13119 very likely applies. Often times, especially charter cities and counties, run their own elections. They are still subject to the Elections Code. Might any "local governing body" be liable under Elections Code 18401? You could make an argument that they are. They are the ones to create the ballot statement language. They order the election. There is no such thing as too much notice. Give your "local governing body" notice of 13119. You might even include the penalty under 18401 in the notice. Let them worry about it. Each of the 25 registrars, as well as all their agents, are now liable for criminal penalties because they printed ballots that don't comply with the law. Do you live in one of the counties? Do you know someone who does? Are you going to let these criminals get away with aiding and abetting the theft of billions of dollars a year in your local property taxes? Call me.